Common pets throughout the world, hamsters are small, cute and readily available in the pet trade. Two genera contain the most common pet hamster species: Mesocricetus (Syrian hamster) and Phodopus (dwarf hamsters). Hamsters are closely related to other small rodents including mice, rats and voles. Hamsters belong to the Animalia kingdom, also known as Metazoa, which houses all animals, including humans. They fall into the class Mammalia (mammals), and belong to the order Rodentia, which contains all rodents. The family Cricetidae, to which hamsters belong, also contains New World rats, mice, voles and similar rodents. Several genera are categorized under the subfamily Cricetinae, or hamsters, including Mesocretus, the golden hamsters, and Phodopus, the dwarf and desert hamsters. The hamsters of the world are all closely related. While the Syrian and dwarf hamsters are popular as pets, others are widely distributed throughout the Old World in the wild. The various species of hamsters range in size from approximately 2 inches long to over 13 inches. In general, hamsters live in dry, open habitats such as plains, deserts, foothills and steppes. Hamsters, being rodents, have much in common with rats, mice and gerbils. They're omnivorous, eating both meats and vegetables. Like other small rodents, they have the need to gnaw and chew to keep their perpetually growing teeth short. They prefer to hoard food in their cheeks, like some other types of rodents, such as squirrels. Pet hamsters display many of the same behavioral traits as their wild relatives. They are nocturnal creatures by habit, preferring to sleep throughout the day and go about their duties at night. In the wild, hamsters have burrows with multiple tunnels and chambers with different purposes—such as one for sleeping and one for eliminating. 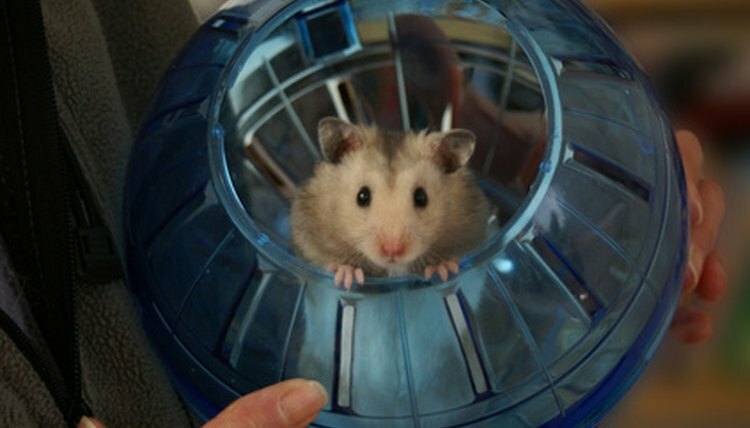 In captivity, many hamsters will choose different corners of their cage for different purposes.